As developers, automation is a very powerful tool to have for many reasons. First and foremost, it ensures that the team almost always has access to the latest build without having to lose their precious time building it. Also, if a developer finds a bug, having a build independant of individual development configurations can tell us if the bug is in the depot or only on his machine. Finally, you can successively build for multiple configurations (x64, x86, Development, Shipping) and send them to the appropriate people. This is why I absolutely wanted to have automation before even starting to work on Astral Tides. Even though I had never tried to make Jenkins work with Unreal Engine before, I knew it would save us a lot of time and problems down the road. 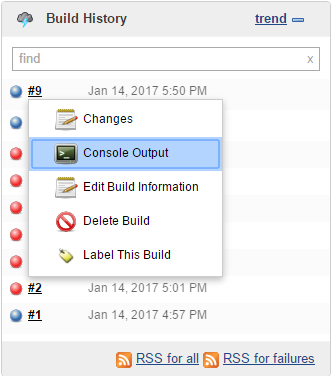 Since I didn't find a whole lot of guides combining Jenkins and Unreal on the web, I thought I would make one myself and let my fellow developers avoid the mistakes I made. The few guides I found were not bad by any means, but I felt like they were skipping over some basic stuff in favor of more advanced automation setups. They were also not explaining how to automatically compile the C++ code from Jenkins, which quickly becomes a problem as soon as you have more than one programmer working on the project. 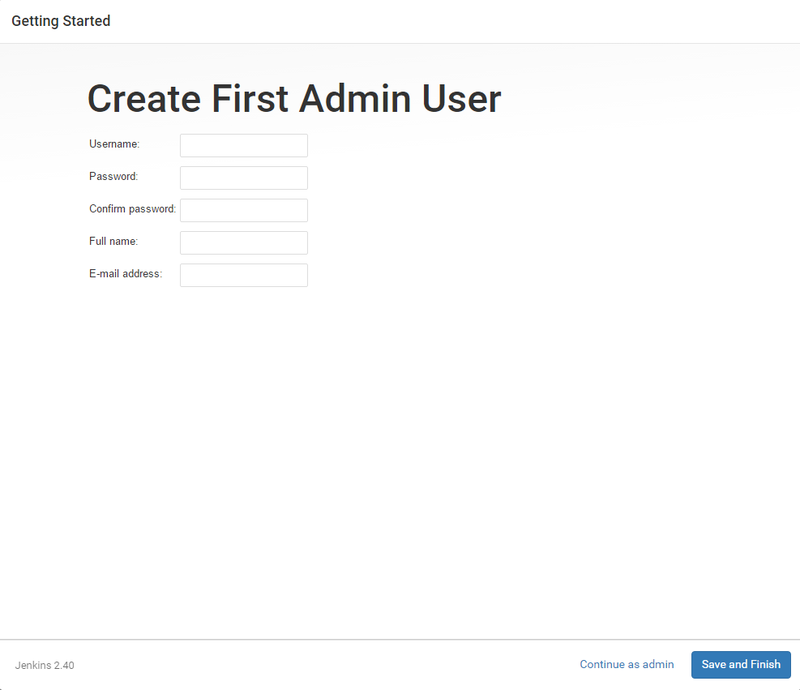 Once again, it's up to you to create a custom admin user or use the default one. If you don't create a custom one, you will have to use the long password you entered earlier every time you need to execute admin actions. First of all, try to access your server's 8080 port directly from its IP address. If you see a "This site can't be reached" error, it's probably due to the 8080 port not being forwarded correctly. If you don't know how to forward a port, this is a good place to start. 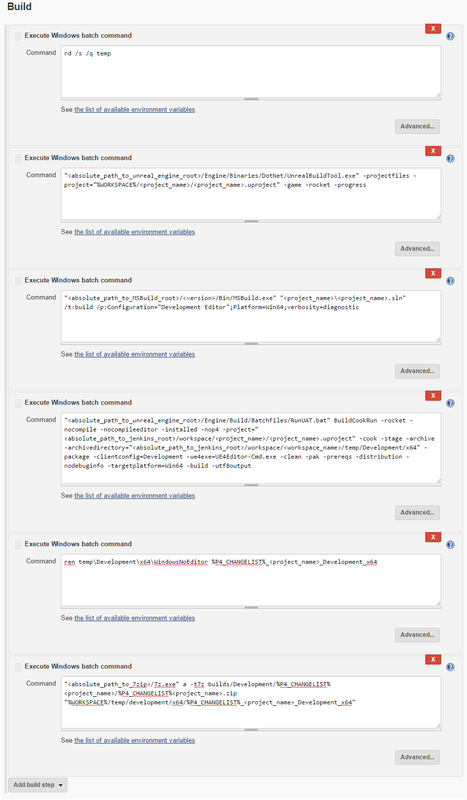 You might have noticed that Perforce is not there yet. 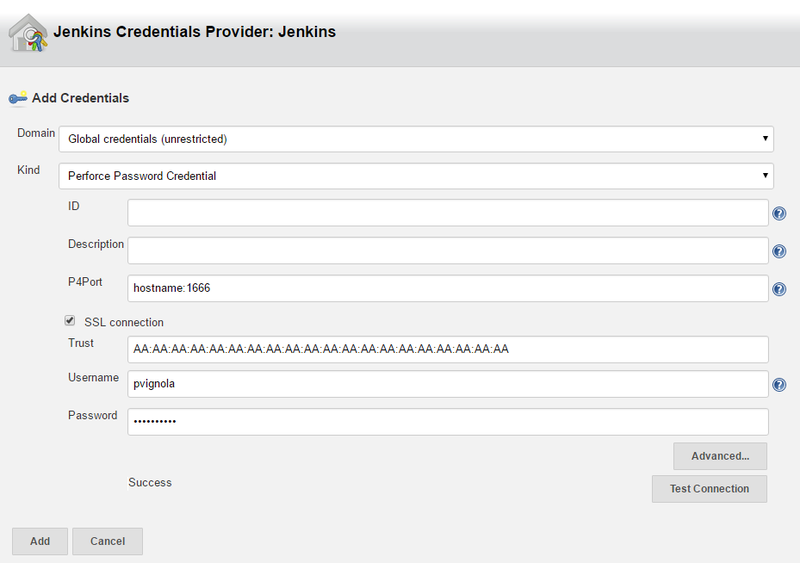 If you want to link Jenkins to Perforce, follow me to the next section. 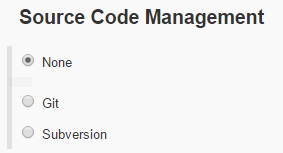 Otherwise, you can configure your own Source Code Management settings and then skip to the next part of this guide, Automatically Build Your Game. This part is optional and only relevant if you are using Perforce. 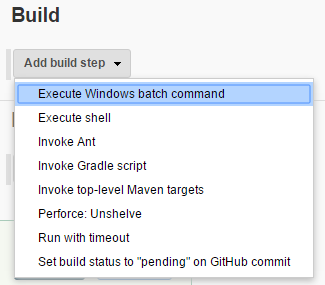 If you plan to use Git, Subversion or another source code management system, you can skip it entirely. 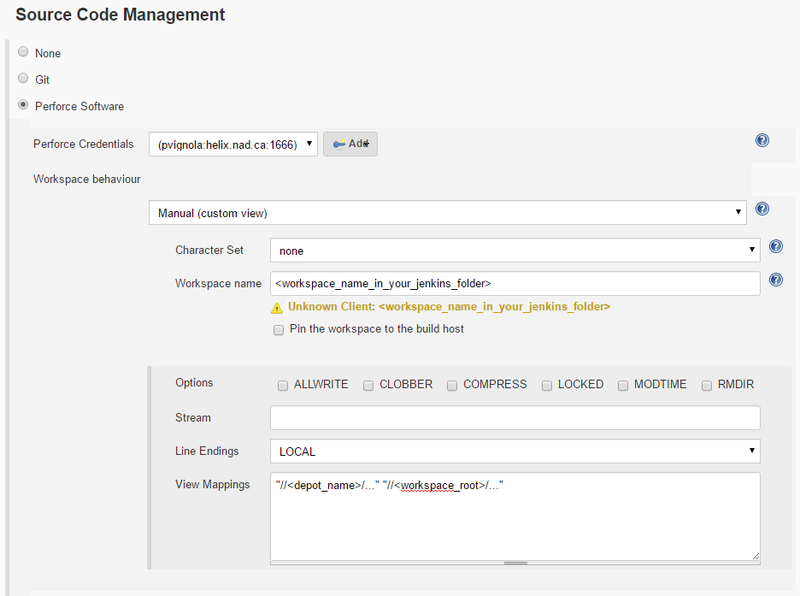 Jenkins will proceed to install the plugin and, after you check "Restart Jenkins when installation is complete and no jobs are running", you will be able to finally select Perforce as your Source Code Management settings for the project you created earlier. Click the "Test Connection" button and, if everything is OK, the "Success" message will appear. You can now go ahead and add this credential. There are many ways to configure the remaining settings, but my suggestion is to make perforce pull everything from the root of the depot. Workspace name: The name of the workspace (folder) where you want Jenkins to store the depot files on your local disk. 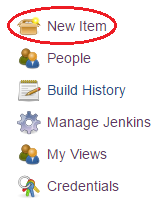 If the workspace doesn't exist, Jenkins will create it automatically when it starts a job. You can also use wildcards with the job number or perforce revision if you want a new workspace for every job, but this is out of the scope of this tutorial. View Mappings: Your depot-workspace link information under the format "//<depot_name>/..." "//<workspace_root>/..."
If everything was configured correctly, the build color will be blue and you will see the "Finished: SUCCESS" message at the end of the console output. Congratulations, your Perforce setup is now over. It wasn't too hard, but people sometimes struggle with one or two things because they are not sure which plugin to download or what to put in the "View Mappings" field. Bellow are the 6 commands you need to add in order to make a successful build. The order is important! The purpose of this command is simply to make sure that we have a clean folder to work with every time. 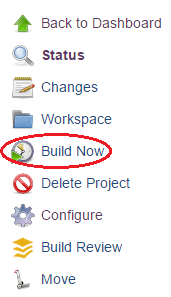 This is important to put it at the very beginning since builds may sometimes fail in the middle or be canceled, so we would find ourselves with an existing temporary folder for subsequent builds (and we don't want that). It will be explained later on what to put in this folder. <absolute_path_to_unreal_engine_root> usually looks like C:/Program Files/Epic Games/<version> and the %WORKSPACE% variable will nicely translate the absolute path of your Jenkins project's workspace for you. This command uses the Unreal Build Tool in order to generate the project files and is the equivalent of right-clicking on the .uproject file and selecting Generate Visual Studio project files. I didn't find any official documentation on this, but I found it was a necessary step to make sure that the .sln exists and that all the prerequisites are up to date. <absolute_path_to_MSBuild_root> usually looks like C:/Program Files (x86)/MSBuild and <version> is dependant on your version of Visual Studio. This command will make sure that the dll is always up to date. Again, I didn't find any documentation related to this and found the command by trial and error, but I found it to be a crucial step in order to successfully build the game. The reasoning behind it is that since the game's .dll is something you should never version control, Jenkins needs to build it every time it makes a build to make sure it's up-to-date. This is where most of the job is done. I am not going to explain every parameters in detail, but this command will essentially build the game by using the .dll we compiled earlier and all the assets and blueprints in your project in order to make an executable. If you want faster builds, you can remove the -clean parameter, but this is unsafe and you might still need to do a clean build regularly to make sure that you don't have leftovers. You can also change the target platform to target Win32 instead. This step is completely optional, but it's nice to have and makes things easier to work with. Unreal puts your game in a WindowsNoEditor folder by default, so we simply rename that folder to a name that is directly linked to the revision of the SCM. I used %P4_CHANGELIST% because I'm working with Perforce, but it works for other SCM too. For Subversion, you can use %SVN_REVISION% instead. "<absolute_path_to_7zip>/7z.exe" a -t7z builds/Development/%P4_CHANGELIST_%<project_name>/%P4_CHANGELIST_%<project_name>.rar "%WORKSPACE%/temp/development/x64/%P4_CHANGELIST%_<project_name>_Development_x64"
For this command, you can choose the file archiver of your choice; it doesn't really matter. It only needs to be able to archive a folder and produce a .rar or a .zip. Note: If you are using 7zip, you need to provide the full, absolute path to the build folder (e.g. 114700_<project_name>). Otherwise, it will store all the relative folder hierarchy in the .rar archive and bury the executable 5 or 6 folders deep. Hooray!! We are now essentially done. We can stop here and have a perfectly fine development build that will frequently poll our SCM and start a new build if necessary, or we can do even better. What if, with only one click, we were able to build a Shipping version of the game that will be optimized and ready to be sent to the public? This is exactly what we are going to do in the next section. Let's go! This guide ended up being longer than I initially thought, but I hope it helped some developers who wanted to try automation with Unreal Engine and Jenkins for the first time. Don't hesitate to contact me on twitter @patvignola if you have any questions or comments for me.